Dublin city centre is undergoing a resurgence in investment in high end retail space, a new study has found. The research by BNP Paribas Real Estate Ireland (BNPPRE) shows Grafton Street, Henry Street and Mary Street areas are seeing a growth in supply of new and redeveloped properties as demand rises. The analysis says the completion of LUAS Cross City is one of a number of factors that have boosted that demand. "We are now seeing a welcome boost in the number of schemes that are in planning or under construction," said Kenneth Rouse Managing Director and Head of Investment at BNPPRE Ireland. "This will provide badly needed new retail stock to the city to satisfy demand from occupiers and investors alike." The four main owner of properties in the area are Irish Life, State Street, IPUT and Davy, according to the BNPPRE report, who alone control a total of 69 units or 45% of the total. 20% of the buildings are owned by private investors while owner occupiers have 13% of all properties on Grafton Street and 8% on Henry and Mary Streets. Debenhams is the only private investor owned department store, with all the others owner occupied. 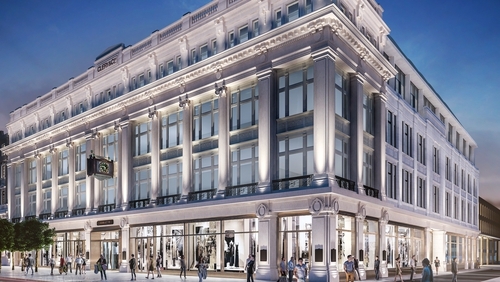 "The large number of high-profile retailers seeking to locate in the Grafton Street and Henry Street areas clearly demonstrates confidence among Irish and international brands alike in the value of Dublin City Centre as a retail destination," said Eoin Feeney, the BNPPRE Head of Retail Agency. Construction has begun or permission has been sought for just under 20,000 sq m of new or redeveloped retail, food and beverage space in the Grafton Street area alone. The largest of these is Central Plaza, the former Central Bank on College Green, backing on to Temple Bar, which will bring a ‘Covent Garden’ style destination to Dublin, the report says. Other city centre retail enhancement currently underway includes the Clerys Quarter scheme. According to the study, footfall has remained relatively strong on Dublin city’s two main shopping streets.